Justin Martin, Writer - Yosemite! People forget that not only was Olmsted a peerless landscape architect, he was also a pioneering conservationist. I’m on a West Coast swing, currently visiting Yosemite — a natural wonder that owes a giant debt to Olmsted. While he was supervising a goldmine in the Sierra Nevada range at the tail-end of the Civil War, Olmsted fell in love with Yosemite. When U.S. Speaker of the House Schuyler Colfax visited the valley, Olmsted arranged to meet up with him. As a one-time journalist, Olmsted was a canny guy and he knew that Colfax would be traveling with an entourage of reporters. Olmsted prepared an impassioned speech about the necessity of preserving wilderness spaces such as Yosemite. Remember, this was before the national park system even existed. 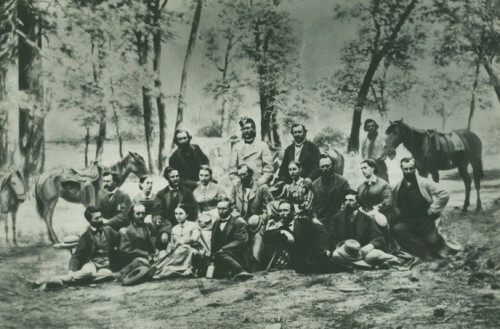 Olmsted delivered his speech to the Colfax party (pictured below; Olmsted is 2nd from left, bottom row) in August of 1865. Sure enough, the reporters’ accounts included mentions of Olmsted’s plea. In fact, some of them wrote books. Speaker Colfax — himself a journalist by training — even wrote a book about the excursion. In a now legendary episode, the idea for a national park system was born in 1870 around a campfire at a different natural wonder — Yellowstone. But this campfire gathering was picking up on a notion that had been building for some time. Olmsted’s earlier address to the Colfax party, publicized in a collection of articles and books, helped send the idea of wilderness conservation ricocheting through American culture. Things came full circle, when after years of mismanagement by the state of California — and thanks to the tireless efforts of John Muir — Yosemite itself became a national park. Of course, nearly a half century earlier Olmsted had been a voice in the wilderness … quite literally. 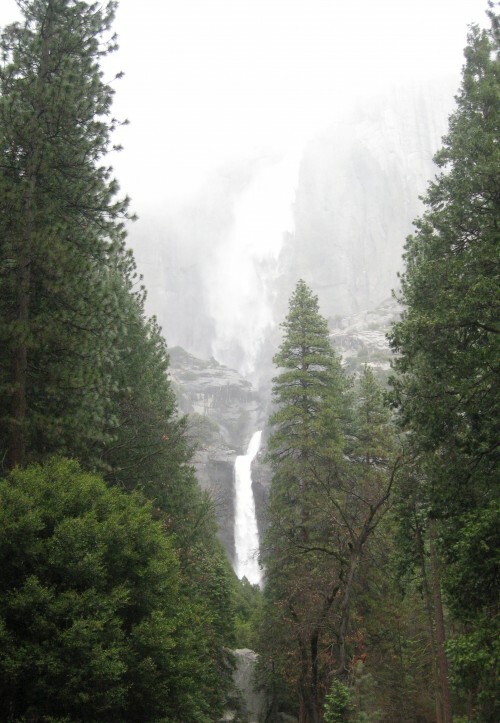 BTW, during my visit, I was awestruck by Yosemite Falls. This was one of Olmsted’s favorite features as well. During a visit in 1864, he put great effort into positioning a group of tents for his friends and family on the valley floor. He wanted to make sure that Yosemite Falls was perfectly framed. Tie back the flaps and a tent dwellers’ view was a triangle, precisely bisected by a line of crashing water in the distance. It was akin to his partner Vaux’s ever-artful archways framing Central park scapes as if they were living paintings.